Born, raised and educated in Orkney, Kevin left school in 1996 at the age of 16 to launch his much desired career as an apprentice with a well known local furniture maker who had the reputation of high quality craftsmanship. 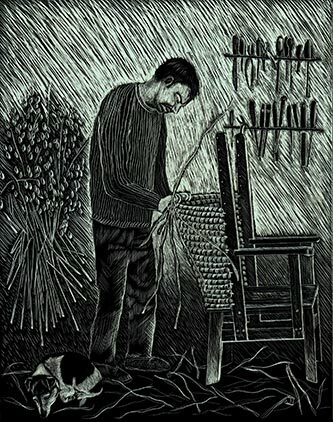 Here, he continued to work and expand his skills and techniques for 9 years which eventually lead to him establishing himself as The Orkney Furniture Maker in April of 2007 with the aim of producing traditional furniture as well as his very own new designs. Working with wood is something that has always been of great interest to him. Kevin's great-grandfather was also a furniture maker in Kirkwall before he left to serve in World War One and his grandfather was a boat builder on the island of Westray; working with wood is most certainly in his genes. Every piece from Kevin's collection is individually created by him and his small dedicated team. Clients are guaranteed a one-to-one basis with Kevin, allowing him to create the ideal piece. Kevin has a strong eye for good design and is passionate about sourcing the right materials for his work. A keen interest is experimenting with new materials and processes to create a unique and new piece of furniture. He has an individual approach to making his furniture, using a mix or traditional skills and modern machinery; this has led to Kevin exhibiting his work locally, nationally and internationally, and he now has a world-wide customer base. He enjoys reinterpreting traditional designs in his own style and many of his pieces are inspired by pieces of traditional furniture found in Orkney. His work brings together his passion for local traditional techniques and materials, combining them with innovation and design to create unique pieces. With the help of his uncle, who is a fourth generation farmer on their family farm, Kevin grows his own Oats to create the straw backs on his Orkney Chairs, offering a real personal touch. The Orkney Furniture Makers' website is updated regularly with any new designs that have been added to his collection. Please feel free to browse the site and if you would like to contact him then please do not hesitate to do so via e-mail or telephone. You may also place orders for items from his collection via this website using the enquiries page. Images courtesy of Lynda Laird, Sydney Gauld, Oliver Pilcher, Phill Hellewell and House & Garden magazine.